Here's a cheap parlor trick to impress the kiddies. I read about this on usenet the other day and of course I had to try it. 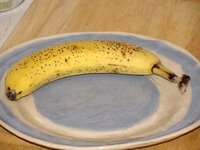 For this trick you will need a banana and a giant safety pin. Open up the safety pin and bend it back so that it is straight, with the non-sharp side making a handle of sorts. 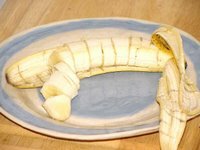 Holding the pin by the handle, stick it into the banana at quarter-inch intervals and sweep it back and forth inside the skin. And voila! 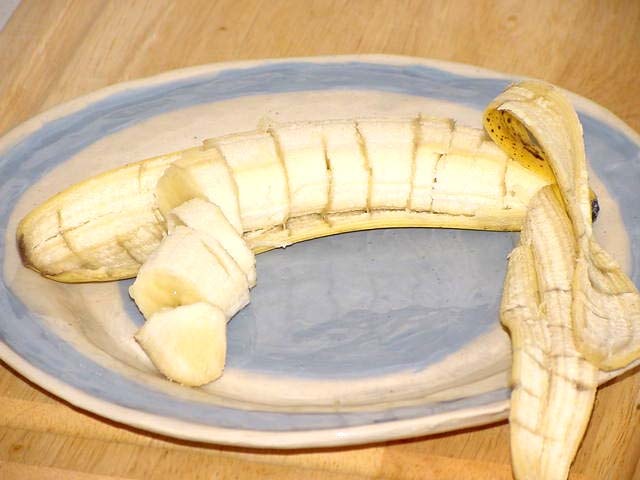 When you unpeel it, you have a pre-sliced banana just waiting to be put over your cereal or oatmeal. 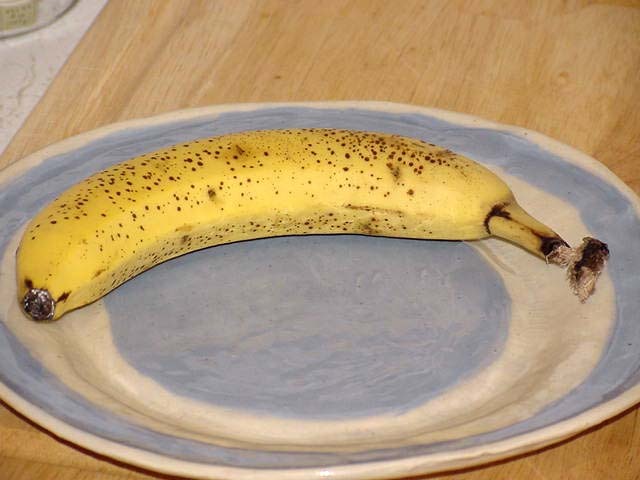 If you rotate the pin around the banana as you go up, it's less obvious. That looks like a regular banana up there, doesn't it? Does anyone know of any other fun stupid things to do with food? And for a not-so-stupid corn trick, I just learned a quick easy way to prepare corn on the cob in the microwave. It's .17 cts apiece at the grocery store so it's time to load up! I tried this method for the first time tonight and it was really fast and easy. And the corn is super super sweet right now. It was so good that I gobbled up all three ears before I could even think about taking a picture. Rinse ears well under cold water. They don't have to be soaked, but should definitely be wet. Put on a plate and cook in the microwave until desired doneness. (I cooked three ears for 3 2-minute intervals). Take them out of the microwave and, under cold running water, peel the husks. The corn silk will come right off with the husks and the ears are still hot enough to dry immediately. The cold water protects your hands while you're peeling the ears.